This is by far the best pasta sauce I’ve ever made! I hope you enjoy it as much as we do. Mix everything in a sauce pan and bring to a boil. Reduce heat and simmer for 20-30 minutes. Serve with pasta, veggies, or anything else you may like. Do you still have leftover meatballs and pasta sauce? Then why not make a meatball sandwich? It’s so simple and a great way to use up what’s left. Heat sauce and meatballs in a small saucepan. Toast buns and place sauce and meatballs on the buns. Add cheese and top the sandwich with the top of the bun. Enjoy! Cook Pasta according to directions on box. Meanwhile, heat pasta sauce and meatballs together in a pot. 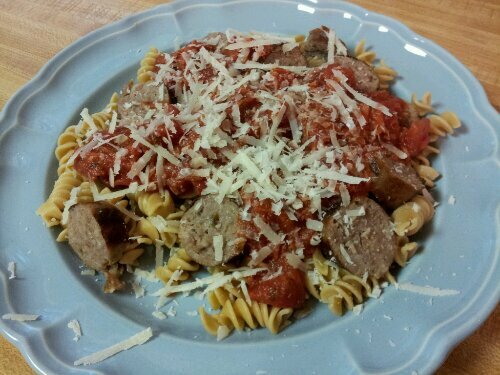 To serve, top pasta with pasta sauce and meatballs. Grate some Parmesan cheese on top.